There are already over 41 free calendar links and it's a growing list! *1* Free printable one-page ready-to-print 2014 calendar: 4 seasons, colorful design from Tanganika nncdesign. *3* Free printable 2014 pastel pattern stripes calendar (3 color options) from lovevsdesign. *4* Free printable 2014 seasons calendar (3 color options) from lovevsdesign. *5* Free printable 2014 pastel colored one-page calendar from stylish living. *6* Free printable classy white, beige and black colored 2014 calendar (two pages) from my scandinavian home. *7* Free printable black'n white colored 2014 calendar (with 2 design options) for typo lovers from only deco love. If you are a lover of typography you will be thrilled! 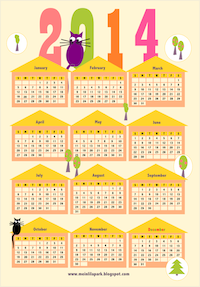 *8* Free printable one page 2014 calendar (chose between pdf, jpeg or png format) from agrigiart. *9* Free printable one page 2014 calendar in vintage design from crafty vintage girl via heartwarming vintage. *10* Free printable one page 2014 calendar: each month in scalloped circle tag design from Maya Road. *11* Free printable one page 2014 calendar with a smiling horse (and other versions) from photo elsoar. *12* Free printable 2014 gemstone calendar in watercolor design from lovevsdesign. *13* Free printable 2014 calendars in watercolor design with flowers from lovevsdesgin. *14* Free printable one page 2014 calendar in cute cupcake design from cupcake clipart. 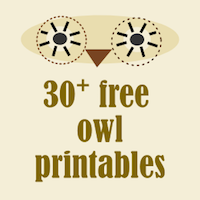 *15* Free printable monthly 2014 owl calendar (featuring 50 artists and their owl illustrations - and you can chose the illustration for each month!!) from my owl barn. *16* Free printable monthly 2014 calendar "Year of Color": each month (page) featuring colorful and cute illustrations from designisyay. *17* Free printable monthly 2014 calendar: live free - love life from miss tiina. *18* Free printable 2014 monthly write-in calendar from lauras crafty life. *19* Free printable 2014 monthly planner calendar in cheerful striped design (with step-by-step tutorial for DIY planner) from jenna sue. 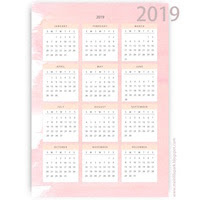 *20* Free printable 2014 monthly planner calendar (each month planner featuring a cute small graphic on it and can be downloaded separate) from activity village. *21* Free printable 2014 monthly calendar with wonderful children art design from the illustrator barbara jelenkovich. *22* Free printable 2014 monthly write-in calendar in cute scrapbooking design for kids and families from imom. Each month can be downloaded on its own. *23* Free printable 2014 monthly write-in calendar planner in confetti design from elli. *24* Free printable 2014 monthly planner calendar (vibrant colors and geometric pattern) from botanical paperworks. The calendar includes all major Canadian and U.S. holidays. *25* Free printable religious mutual themed logo planner calendar from hang a ribbon on the moon. *26* Free printable "Sweet New Year" 2014 monthly calendar: calendar cards (4 pages pdf) with illustrated sweets from eat and drink chic. 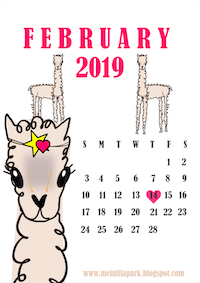 *27* Free printable monthly calendar cards from findingnana. Perfect for project life. *28* Free printable monthly calendar cards with stylish art and fashion illustrations from Sara Woodrow. *29* Free printable monthly 2014 planner in french with from le grand bazar. 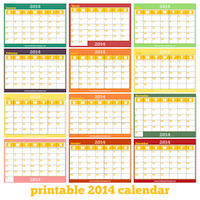 *30* Free printable monthly 2014 calendar: pdf calendar PRO = fillable and editable in 5 theme options! from world label. *31* Free printable monthly 2014 calendar mini cards in chalkboard design (with calendar case tutorial) from create craft love. *32* Free printable monthly 2014 calendar planner in lovely pastel colored pattern design from blooming homestead. *33* Free printable monthly 2014 calendar planner from shining mom. *34* Free printable monthly 2014 calendar planner from irishmcsweeney. *35* Free printable one page 2014 coffee break calendar from me in lila park. 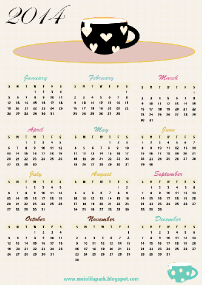 *36* Free printable one page 2014 cat town calendar from me in lila park. 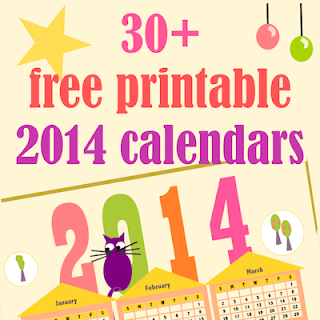 *37* Free printable 2014 year-at-a-glance cats calendar from me in lila park. *38* Free printable 2014 year-at-a-glance coffee calendar from me in lila park. 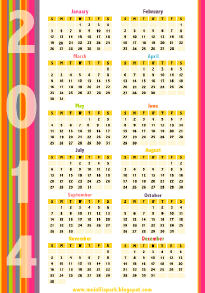 *39* Free printable one page multicolored 2014 calendar in striped design from me in lila park. 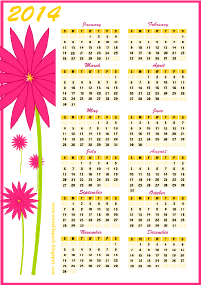 *40* Free printable one page 2014 calendar with huge flower from me in lila park. *41* Free printable monthly 2014 planner calendar from me in lila park. ☞ The list of free printable 2014 calendars has grown! I just stumbled on this thank you for your kind words!